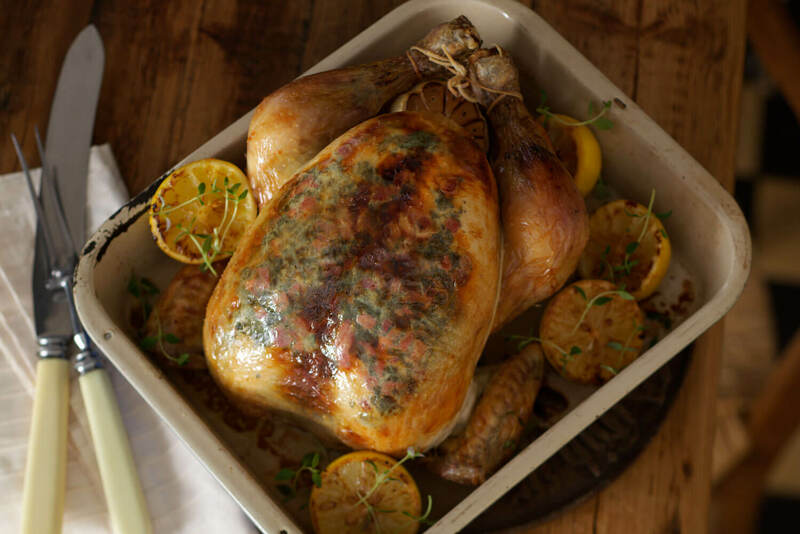 Garlic, Herb, Pimento & Lemon Roast Chicken | Packington Free Range | Born and reared outdoors. Always. The classic flavours of garlic, herb and lemon Roast Chicken served with pimento could certainly brighten up anyone’s meal time. The flavours that go so well together will be devoured instantly when put onto the table, what can I say? The taste of the sweet lemon paired with fragrant herbs are simply so enjoyable. Preheat the oven to 180 C/Gas Mark 4. For the butter; mix together the butter, garlic, pepper, herbs and seasoning until well combined. For the chicken: place the chicken on a board and carefully ease your fingers then your hand under the skin of the chicken at the neck end, freeing it from the breast meat. Smear the butter mixture over the breast meat under the skin. Then tuck the flap of skin underneath. Place the garlic and 2 lemon halves in the carcass. Rub oil all over chicken and season. Place in a roasting tin and scatter around herbs and remaining lemons. Calculate cooking time allowing 16-20 minutes per 450g/1lb plus 16-20 minutes or until juices run clear from the thigh when pierced with a knife or skewer, cover with foil if browning too much. Remove the chicken from the oven, skim off excess fat and then scatter round fresh herbs, cover and allow to rest for 10-20 minutes. Carve and serve with any pan juices.